Add a new post to Caption this photo. This contest will go from now until Feb 1st, 2015. I will check this thread in the late evening of Feb 1st and declare the winner around 11pm CST. Submissions can be in any written form (no video or audio files) — caption, limerick, motivational, poem or prose — whatever inspires you to describe the photo or catch attention. Submit by replying to the thread. Important: whether you submit an entry or not, please “like” any posts you feel deserve it as this is how the winner is chosen! The "thread starter" is the moderator and must post an original photo at the start of the thread. In case of a tie the moderator will choose one to break the tie. The winner of that contest will be notified ASAP after marking by the current Thread Starter/Contest Host and will become responsible for posting the next original work to be captioned. Enter often, vote more often. and most important: Have fun ! I'll feed all your friends but I'm not cleaning up after them. "It's not food! I'm just opening the mail!" Harriet mentally kicks herself for rolling her eyes whenever her teachers said, "I hope you brought enough for the whole class! " Sharon always thought her singing attracted the birds - no one had the heart tell her she was tone-deaf and the birds don't care. The rumors are true! Hitchcock did make an outtake compilation, click the still above for the video. And ate up the roll; munch, munch, munch! Revenge is quite sweet, so they say! Oooh...!! help... one has gone up my skirt!!! While bird collecting at the park, Steffi realizes she should have brought a larger bag. 새들은 봉지, 두 데나리온 피드. (if the translator worked... "Feed the Birds, Two pence a bag") Doesn't have the same feel as the original in Mary Poppins though does it. 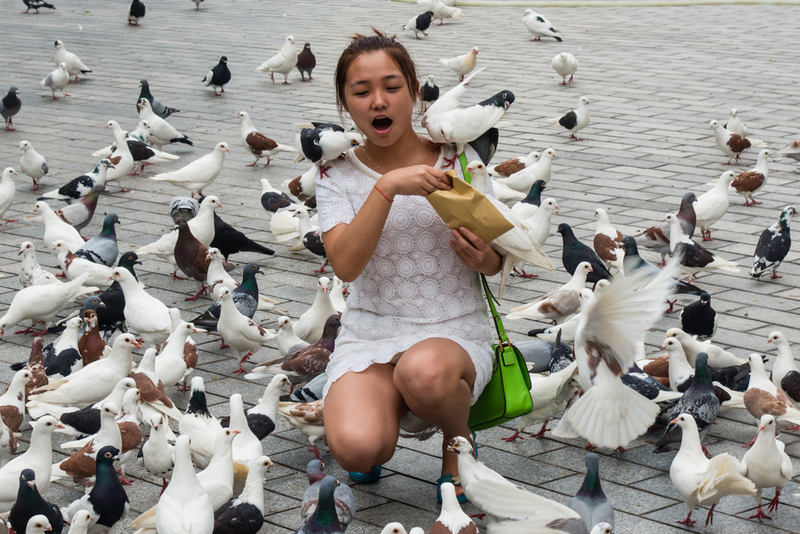 By feeding the birds, Sung Ye discovered the rare Butthead Pidgeon sitting right on her shoulder. While we're poisoning pigeons in the park!!"